San Diego is world renowned for it’s beautiful coastal wild life, historical and modern cities, and of course its sunny, beach culture. There is no doubt that San Diego attracts tourists and visitors from all around the world to experience the San Diego lifestyle. Both locals and outsiders can both agree that San Diego is a beautiful place with an overabundance of exciting activities and new adventures to embark on, but one also has to wonder if San Diego is also a good place to invest in property or to own a home? Currently, the overall US housing market is thriving and many individuals are looking to invest in property all over the country, but of course there are some specific location that would be better than others to invest in property. Experts conclude that San Diego housing prices will continue to increase, and even if there is an unexpected decline, it will still be above the rate of inflation. In the NAR Quarterly Report released in February, 2016 it was that San Diego ranked 5th in the most expensive housing markets in the United States where the median sales price was up 5.9% at $486,000. However like many other cities, economists predict that San Diego’s surge up in home prices will start to slow as some estimate that it is close to peaking. In terms of rent prices, San Diego was ranked number 10 in American cities where rent was growing the fastest. There is a high level of competitiveness among renters in San Diego since the rent-ability is only around 5% in latest statistics, however this can mean great news for property investors and landowners. If the property you are investing in is decent condition in a fairly nice location, you will receive many applications and options to rent out your house or apartment. With this level of competition and demand, owning a property and renting it out is an effective and smart way to have another solid source of income and increase cash flow. San Diego is also one of the few places in the US where out-of-town investors are encouraged and willing to invest and buy property. Due to San Diego’s low crime rates, comfortable climate, and a bustling economy in the tourism, technological, and medical fields, non-San Diegans have goods reasons to safely invest in property with minimal risk. Finally, the cultural and ethnic diversity in San Diego makes its a very warm and welcoming city; on top of which, San Diego is also renowned place to live for it’s top rated schools, efficient public transportation, and is environmentally aware and friendly. There is no question that San Diego is a great and amazing city and owning or investing in a property here would only be beneficial and positive! Make the sauce: Melt the butter in a skillet over medium heat. Add the garlic and lemon zest and cook until the garlic is slightly soft, about 1 minute. Add in the flour and cook, stirring with a wooden spoon, 1 minute. Whisk in the milk and 3/4 teaspoon salt and cook, whisking constantly, until just thickened, about 3 minutes. Add the Neufchatel and parmesan cheese; whisk until melted, about 1 minute. Stir in the chopped parsley. Meanwhile, bring a large pot of salted water to a boil. Add the fettuccine and cook until al dente, 2 to 3 minutes. Reserve 1 cup cooking water, then drain the pasta and return to the pot. Chocolate chip cookies are a go-to favorite dessert, sweet snack, or after-school treat. With our easy, three-step recipe, you’ll have soft and chewy chocolate chip cookies to serve and enjoy in no time. 1. Preheat oven to 350 degrees. In a small bowl, whisk together the flour and baking soda; set aside. In the bowl of an electric mixer fitted with the paddle attachment, combine the butter with both sugars; beat on medium speed until light and fluffy. Reduce speed to low; add the salt, vanilla, and eggs. Beat until well mixed, about 1 minute. Add flour mixture; mix until just combined. Stir in the chocolate chips. 2. Drop heaping tablespoon-size balls of dough about 2 inches apart on baking sheets lined with parchment paper. 3. Bake until cookies are golden around the edges, but still soft in the center, 8 to 10 minutes. Remove from oven, and let cool on baking sheet 1 to 2 minutes. Transfer to a wire rack, and let cool completely. Store cookies in an airtight container at room temperature up to 1 week. If desired, use a small ice-cream scoop for uniform-size cookies. When it comes to Independence Day, San Diego goes big. 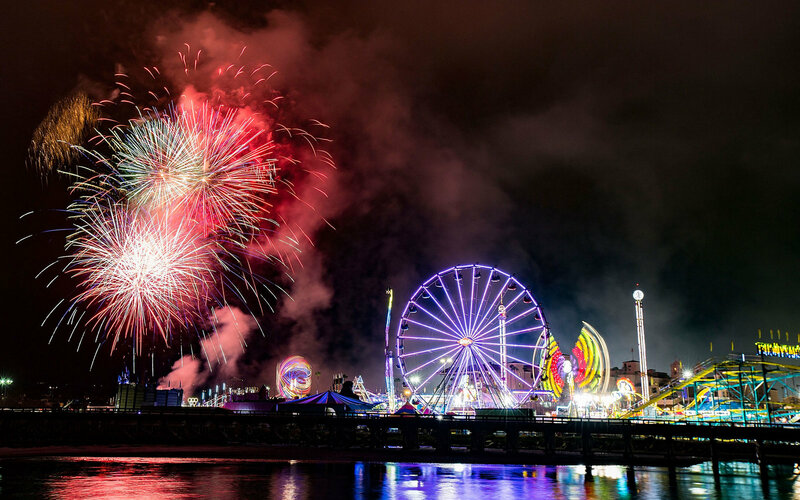 So big, in fact, that the city is home to one of the largest firework displays on the West Coast (if not the largest). It’s a time-honored tradition that never fails to deliver a good time. So where can you go to catch the show? Luckily, T+L has you covered. From a rooftop speakeasy in the Historic Gaslamp Quarter to a cruise around San Diego Bay to the terrace of one of the city’s most celebrated hotels, read on for the best tricks, tips, and spots to make the most of your holiday this year. There are only three words to describe July Fourth in downtown San Diego: Big Bay Boom. Starting at 9 p.m. and launched from barges located around the bay, not only is this the largest fireworks show in town, but the display is so big and so loud, it can be seen and heard from pretty much any part of downtown. If you want to be in the thick of the action, your best bet is to heed Horace Greeley’s advice and “head west.” You can’t go wrong in Pacific Beach, Mission Beach, Harbor Island, and Shelter Island—all great locations to see the fireworks. Get there early and post up at the beach with all your essentials. These areas tend to fill up fast and it will be more rewarding if you come prepared with beach blankets and beverages in tow. As in years past, a free shuttle service will be available to and from Harbor Island and Shelter Island. Mission Bay is a perennially popular party spot, made all the more fun if you have access to a boat. Speaking of boats, harbor cruises are a really fun and exciting way to spend the holiday. Check out Hornblower Cruise Line’s special 4th of July Fireworks Dinner Cruise. Included with the price of admission is a dinner buffet and some killer views of beautiful downtown San Diego. If you’re hoping to stick around the city, The Nolen’s rooftop bar and lounge in the heart of the historic Gaslamp Quarter is your best bet. Likewise, the views from Mister A’s rooftop will go un-paralleled, as will the experience of dining at one of the city’s most distinguished locales. For those looking to mix in a bit of history on this already historic occasion, Old Town will be hosting a free, old-fashioned Fourth of July celebration where guests can relive the excitement of an 1800s Independence Day party. The all-day event starts at 10 a.m. and includes activities and games for all ages. Guests are encouraged to participate in the parade around the plaza reminiscent of the July 4 parades of early San Diego with music, animals, banners, and people in historical costumes. Working your way up the coast, La Valencia Hotel—also known as La Jolla’s Pink Lady—will come alive with music and entertainment for this year’s Fourth. Perched above the cliffs of La Jolla Cove, this timeless hotel offers extraordinary views of the Pacific Ocean and overlooking Ellen Browning Scripps Park guests and diners can enjoy drinks on the terrace of the hotel which affords both the views and a sense of respite from the crowds below. If you’re looking to celebrate in style, guests of the Fairmont Grand Del Mar will be able to partake in their own private fireworks show. As in previous years, the party will take place on the resort’s Aria Lawn and feature a sunset barbecue buffet including all-American favorites, live music, and some of the best fireworks in town. Non-resort guests can enjoy a Fourth of July brunch from 11 a.m. to 3:30 p.m., or dinner from 5 p.m. to 10 p.m. at Amaya. For more information about where or how you can celebrate this fourth of July, check out SanDiego.org. Buying a home is a huge deal for everyone. Unfortunately, there are many big mistakes and pitfalls that buyers often make. These mistakes complicate the home buying process and can cost you tons of money and time correcting the mistakes. Many buyers get caught up in the excitement of purchasing a home and let their emotions make decisions, only to find out they missed an important step. This post will explore some of the biggest pitfalls buyers make when looking to purchase a home. It’s important to remember that while you may be able to learn a lot about purchasing a home on the internet, it is impossible to learn everything. Real estate is a constantly evolving market and something you read just last year could now be useless. There are many aspects of purchasing a house that buyers don’t even know exist. From the buyers and sellers agent, to appraisers,to inspectors, to attorneys and mortgage bankers. Each one of those jobs have professionals that perform those tasks 8 hours a day, every day of the year, and have perfected the profession. Trying to save a few hundred dollars by skipping out on an inspection or attorneys is foolish and almost always returns to haunt you. Most people enjoy looking at new homes, but do not enjoy talking about the money aspect. Obtaining a proper pre-approval will save you tons of stress later in the process. Getting a proper pre-approval allows you to know exactly how much money you are capable of spending on a house and helps you narrow down the market to what you can afford. Additionally, some buyers are able to use their pre-approval as a negotiating tool to help get the price down. When looking to purchase a home people tend to think about the next 4-5 years of their life, instead of the next 8-10, which is where they should be thinking. Yes, 5 years is a long time and a lot can change from job and marital status to children, but selling your home does have a cost. If the market does not appreciate quick enough you can stand to not get your moneys worth from the original purchase. Obviously there are many circumstances that no body is able to predict, but spending time thinking through just some of the basic scenarios can save you a lot of trouble in the long run. There are many costs involved with purchasing a home that many buyers don’t realize. It is not just pay the listing price and it is yours. There is inspection costs, moving costs, closing costs, escrows, and more. Professionals can explain and walk you through all these extra costs, ensuring there are no surprises at the very end. One of the biggest issues when buying a house is buyers not understanding the market price of a home. People get caught up with what their parents think it should cost, or what you can afford in total, or with personal opinions about the price of a home which often is far different than the market value. There is a very organized process to determine the market price of a home that involves reviewing similar comparable homes that sold within the nearby vicinity. It is important to know what the market value is because a house can be listed over, under, or exactly at market price. Being able to recognize the difference between the listing price and the market price can save you lots of stress and money and help you formulate a concrete offer.